Cala Figuera ("the Creek of the fig tree") is a small fishing port on the southeast coast of the island of Majorca, the town is part of the municipality of Santanyí in the County of Mid-day (Comarca de Migjorn). 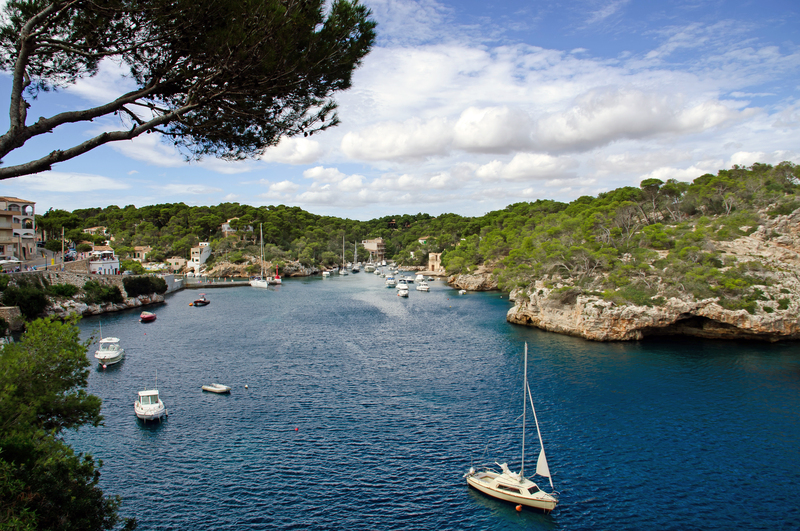 Because the cove of Cala Figuera has no beaches, the fishing village was spared by mass tourism and has retained its charm. The town has about 600 permanent residents, many of whom live off fishing. Cala Figuera is 5.5 miles southeast of Santanyí, the chief town of the district. From Palma, 60 km, can be reached by highway Ma-19 to Santanyí, then the small road Ma-6102. Some beaches are a short distance from Cala Figuera north-east, the beaches of the Natural Park Mondragó the beach Cala Mondragó and the beach S’Amarador ; southwest beaches of Cala Santanyi, 4 km and, a little further from the beach Cala Llombards. The port of Cala Figuera has long been used: it is here that were embedded the famous stone Santanyi, which served, among others, the construction of the Cathedral of Palma. The port is mentioned in historical records from 1306, but the village did not develop until the late nineteenth century and the first church was built in 1938. Wealthy families Santanyí it did build their summer residences among the pines, overlooking the entrance to the picturesque harbor, including that of Nigorra family, owners of the Bank of Credit Balearic (Banc de Crèdit Balear) at the tip of Es Morrás. Today, the village of Cala Figuera extends from the cliffs overlooking the sea, south to the fishing port at the bottom of the creek. In the 1960s the city tried to take advantage of tourism development in Mallorca by building small hotels, the largest of which was the famous Cala Figuera, and a marina, marina Tomarinar. However, due to the lack of beach tourism is not really took off and hotels were often weakly occupied. Hotel Cala Figuera was demolished and replaced by residences vacation ownership. Much of the development is made ​​around the Caló d’en Busques the left arm of the cove of Cala Figuera, the right arm, small Caló d’en Boira was a minor development. Tourism is not absent from Cala Figuera, but it is far from the bustle and nightlife of other coastal towns of Mallorca. The cove of Cala Figuera is very deep and cashed - similar to a fjord is one of the most deep and narrow the island of Majorca. The mouth of the creek on the sea, between the cliffs of Punta de Cala Figuera, the north and those of the Punta d’Es Morrás the south, only 300 meters wide, the entrance to the cove is quite impressive. 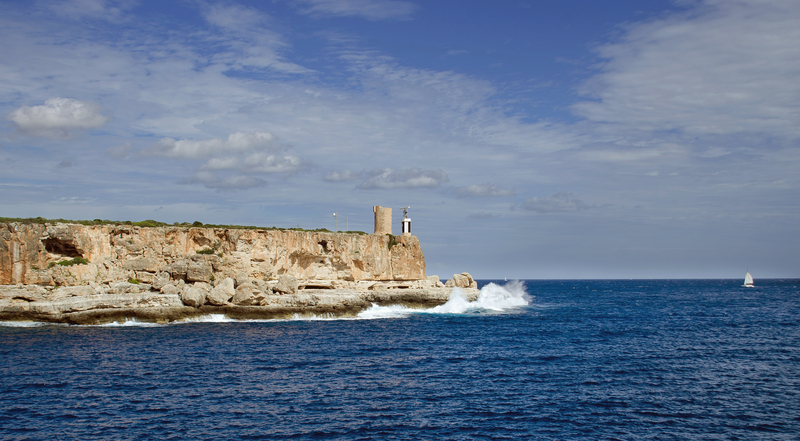 At the forefront of Cala Figuera is a restored tower defense, known as Torre d’en Beu and a marine beacon. The cove of Cala Figuera is oriented southeast to northwest, and is exposed to easterly winds, the navigation can be complicated by strong winds. After 550 meters the creek splits into two calons: the right arm is known as Caló d’en Boira (the "Fog Creek"), about 200 meters long, with the same orientation as the entrance to the cove and this caló is less protected than the left caló, known as caló d’en Busques, about 250 meters long, which is sheltered from storms. It is in the Caló d’en Busques the port was built. The port of Cala Figuera is a beautiful natural harbor at the far end of Caló d’en Busques and is accessed by a narrow entrance, just 30 meters wide, protected by a breakwater. The harbor is home to mainly fishing boats, including some traditional boats "fishing beef" (barques de bou), but also professional trawlers and many small Majorcan traditional boats, called "llaüt" for their rounded shape as that of a lute. Cala Figuera fishermen are allowed, exceptionally, to fish in the coastal areas of the Mondragó Natural Park, a protected natural area, located northeast of Cala Figuera. The port can only accommodate a small number of pleasure boats, most of the few places are occupied by the boats of the inhabitants of Santanyí, who are fond of this port they call "Sa Cala". Every day the brightly colored boats unload their catch, much to the delight of tourists. At the bottom of the harbor, hiding the picturesque fishermen’s houses with their boathouses, and a small fish market, the dry dock repair nets that fishermen. Redstar Tours offer various excursions to the main creeks located southwest of Cala Figuera : Cala Santanyi, Es Pontás, Caló d’Es Macs, Cala Llombards, Caló d’Es Moro, Cala S’Almunia and Cala Marmols. Special outings to Cala Mondragó and alibi. The Rocamar Hotel is a 2 star hotel, located on the top of the cliff of Punta d’Es Morrás on the south side of the cove of Cala Figuera. Hotel - 42 rooms - is very quiet and offers beautiful views of the creek from its terrace. It is around 50 € per night. Address: Calle Juan Sebastian Elcano, 38. Coffee Bon Bar offers a wide view of the greater part of the cove and harbor of Cala Figuera.